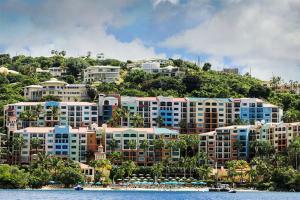 Perched on the hillside overlooking Pacquereau Bay, Marriott's Frenchman's Cove boasts panoramic views of the St. Thomas harbor. The dock and secluded beach are just steps away. The resort is reminiscent of a quaint village and inspired by Danish and British architecture. 221 elegantly appointed two- and three-bedroom villas range in size from 1,179 to 1,500 square feet with fully equipped kitchens, private balconies or terraces, separate living and dining seating for six to eight and high-tech design. The Adventure Center offers exciting activities such as night kayaking. Resort amenities include an infinity pool with waterslide, a childrens' center, a 24-hour gym, free parking, Wi-Fi throughout, and a movie theater - all with no resort fees.